Rug appraisal - what is your rug worth? The history of collecting antique rugs and carpets has been around for centuries. In fact, King Henry VIII had several Turkish rugs in his collection. You can even see these rugs used in his many portraits with Hans Holbein. In addition to Henry VIII, other avid collectors of antique rugs and carpets were Sigmund Freud and Cornelius Vanderbilt. These references showcase the history of collecting antique carpets and rugs throughout history. The individual history of each type of carpets and rugs are far more diverse. After all, there are several types of carpets and rugs in the market. Some of the most commonly collected types of rugs out there include Oriental Rugs, Turkish Rugs, Persian Rugs, Celtic Rugs, and more. Each of these types features distinctive characteristics and level of artistry, which can have an impact on whether collectors would want to own them. Exquisite carpets, rugs and runners, whether they are Turkish, Persian or Afghan, add a warm and rich touch to your home décor. However, with the entire bargaining going on in this field, it is hard to estimate the right market value of a carpet or rug. If you want to know how much your antique Persian carpet or the small Ushak rug in your entryway, we put you in contact with specialized experts from interested auction houses. The experts will assess your object’s material, condition, subject matter and style thoroughly and provide an online appraisal, including the item’s market value, estimated price and reserve price. In order to get the most accurate appraisal, make sure you fill the form carefully and take as many pictures to define the condition and style of the object. If I submit an antique rug for an appraisal, am I obligated to sell the antique rug? Are there any hidden costs or fees with an online rug appraisal? 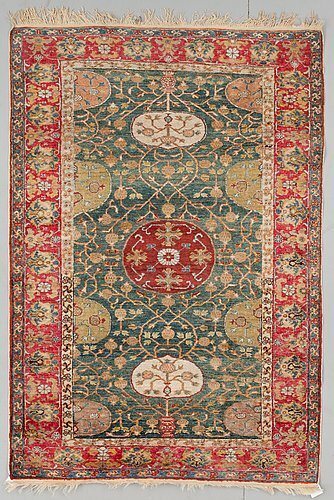 When will I get my online rug appraisal? We guarantee your rug appraisal within 48 hours on weekdays, but most often it is faster. Can I ask the specialist a question about the value of my rug? Can you appraise any antique rug? What happens after I receive the rug appraisal? this is an Egyptian made rug using local wool and synthetic material to imitate Persian rugs. size: 9'-6"x7'-1"
Authentic zebra hide that I got at an estate sale. They used it as a wall covering so it has hardly any wear and tear. They put a felt backing around the edges to hang it, but I pulled it off to use as a rug. Oval red and white wool Chinese rug. KPI is 30. 6ft length by 4ft 1in wide. At least 30 years old.